Jacob set out from Beersheba for Haran. When he reached a place, he decided to take some rest from his journey and spend the night there. So Jacob took a stone to put it under his head as pillow and he lay down to sleep. 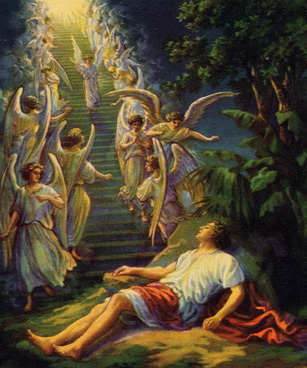 Then Jacob dreamed of a ladder that reaches high up into the heaven and angels were ascending and descending from it. So Jacob took the stone that he put under his head as pillow and makes an altar of it. Jacob called the place Bethel although the city is called Luz.